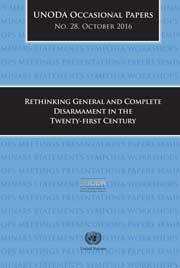 This publication’s authors, who include some of the world’s leading scholars, diplomats and activists on the topic, examine historic, strategic, humanitarian and economic aspects of general and complete disarmament to elaborate and elevate the case for prohibiting conventional weapons systems as well as nuclear weapons. The featured articles were originally presented at the seminar held at the United Nations Headquarters in New York on 21 October 2015 entitled “Comprehensive Approaches for Disarmament in the Twenty-first Century: Rethinking General and Complete Disarmament”. It was organized by the Centre for International Studies and Diplomacy at at the School of Oriental and African Studies, University of London, and sponsored by the Permanent Mission of Costa Rica.